In certain times, there is a surreal feeling of “being a part of history,” which is perhaps to say, we are living in a time period of dynamic change. However unthinkable for the left it may be, Trump has been elected. We can add this to Brexit and other “unthinkable” events to come. To contemplate the details of what this may entail, such as the selection of cabinet members and policy priorities, which do indeed include “building that wall,” has something of a Christmas morning feeling—everyday. To paraphrase an article from Die Welt, in Western Democracies, the status quo seems stable, and it is not generally considered possible for “extremes” to transpire. But that is what we have seen, however we may want to quibble about what exactly is “extreme.” Can Donald Trump, or the Alt-Right for that matter, be considered “extreme” after that electoral show of consent? Regardless, when there is an endless back and forth between stultifying, uncourageous Republicans and the frankly anti-White agenda of the Democrats, “extreme” does not carry such a negative connotation, but instead implies a kind of deliverance. We have been locked in a middle-class complaisance, and that is precisely why societies such as ours “are often surprised by the foreseeable and obvious.” And alas, though it may be “unspeakable” to liberals, and though he was the object of such ridicule in our media, Trump is now “the most powerful man in the world,” as Die Welt puts it, perhaps with some apprehension. Just let that sink in. Trump’s appeal may have been equally a reaction to Black Lives Matter protests as to immigration. According to exit polls, 74 percent of Trump voters feel that Blacks are treated fairly by the criminal justice system, which by definition means that these voters are not sympathetic to BLM. Overall, half of White voters (Democrats and Republicans) opined that Blacks are treated fairly by police. Likely most of us will have anecdotal evidence that our non-Alt-Right family members and acquaintances were not amused by BLM. Trump voters were especially unamused. Of Trump supporters, 86 percent favor building the wall on the southern border, compared to less than half of all voters (54 percent oppose, 41 percent favor). So antipathy towards both BLM and immigration can be said to have catapulted Trump to the presidency, in part by turning off mainstream middle-class White people, who are normally content with the status-quo. Moderates may not want a wall per se, but they also may not complain too loudly when it’s being built. And again, Trump’s actual voters want it built—unequivocally. While losing some steam amongst college-educated Whites, Trump won the White working class by 39 points, an increase from Romney’s 26 point spread. Ultimately, there is no simple narrative that emerges; Trump increased White support in different key swing states from different rural and suburban demographics in order to dominate the electoral college. I won’t pretend to be Nate Silver, so let’s just say he won because of White people. “Among his supporters,” opines Thomas Friedman on Real Time with Bill Maher, “this was 80 percent about race, and the other 20 percent was about race.” Good then, let’s accept the premise of liberals and draw the necessary conclusions. If Trump triumphed on the basis of race issues, he now has a mandate on immigration, law and order, the wall, etc. For the NYTimes David Brooks holding forth on PBS, Trump voters are “just going with their gene pool,” a rather bald statement that Trump voters are voting their ethnic interests. After the election, Brooks predicted that the country would be split into two factions, with one faction advocating ethnic separatism, what many on the Alt Right are already advocating. Would that it were so. Nixon became known to history as the “law and order” candidate, which accurately characterized his proclivities vis-à-vis crime. Trump, on the other hand, to leave no doubt, self-identified as the “law and order” candidate. As liberals will complain, and as the alt-right will readily admit, “law and order” is understood as to mean that we will not tolerate Black violence and civil unrest. Trump’s support, therefore, was premised on his intolerance for the very violence which his election has provoked (once again) from Blacks and other malcontent minorities, in the protests following his victory, which continue as I write this. It is ironic that Blacks report feeling “scared” at the prospect of the Trump presidency, while they are in fact the progenitors of violence, and so far as I know, Trump never made any negative statements explicitly about Blacks. Their violence and disorder has indeed “scared” the rest of civil society, contributing to Trump’s election. Perhaps Blacks are expressing their fear by attacking innocent Whites, in this inverted reality. How can we assuage these sensitive Blacks’ sense of fear? Shall we become human punching bags? If there is one thing that minorities have learned over the last eight years, it is that they get what they want, and Whites (perhaps as a natural corollary) do not. Hence the indignation following this surprise victory. Some journalists noted with amusement that Trump often played the Rolling Stones’ “You Can’t Always Get What You Want” at his campaign rallies. I hypothesized that Trump liked the song for its beautiful choral section, which has a celestial quality that built anticipation for his arrival on stage. Surely he paid little heed to the message of the lyrics, which discordantly seemed to suggest he was voters’ second choice. But now it all makes sense. I suggest that for our “underprivileged” people of color, it’s time you learned: you can’t always get what you want. Not only is the POC attitude of entitlement and aggrievement ridiculous, it is also presumptuous. Trump haters assume that whomever they happen to be speaking to at that moment shares their hatred for Trump and all that he represents — the liberal bubble that we see over and over again in big cities and universities. Many of us who do not go about their day in a MAGA hat, and appear to be otherwise in step with the mainstream of American society, will often be confused with one who has accepted the anti-Trump bias of pop-culture, which is what all “educated” people after all must believe. They seem to take for granted that as a White person, your chief goal is to champion their causes, what they believe to be important. I’m afraid that no longer interests us, and we have instead decided to look to our own welfare. Of course, minorities’ presumptuous attitude is the result of decades of a cultural Marxist program in the media and education, from which it seems only recently some Whites have begun to break away, however tentatively. Not submitting to minorities’ racial-group interests at our own expense is equated with base racism in this formula. Clearly even the bourgeoisie have become weary of these recriminations. And the White working class is beyond weary of this crap. While the MSM claims that the onus is now on Trump to reach out to those who didn’t vote for him; i.e., Blacks, Hispanics, it would seem that he was given a mandate to serve the interests of those who did vote for him. By this I mean the 86 percent of his supporters who want that wall. 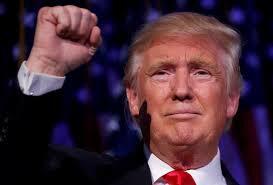 So far, judging by his statements to the media, those he has chosen to keep in his inner circle, and those he has promoted in his cabinet, it is fair to say that Trump is staying true to his roots, while perhaps making some accommodations in order to ensure his agenda becomes a reality. As for the POC, 8 percent of African Americans voted for Trump, after all that attention; and frankly, pandering. Are we supposed to be excited that Trump increased Hispanic support from 27 percent in 2012 to 29 percent? In a sense, these groups are not his constituents. But we can take some comfort in how flummoxed establishment Republicans must be by the fact that Trump did better with their precious minority groups than Romney and McCain. Surely they must be nursing a bad case of cognitive dissonance. Yes, President-elect Trump must represent all Americans in the abstract; but let’s take the MSM at face value: If Trump’s candidacy was always a stealth pro-White Identity project, then it follows logically that he would now carry that project through, and enact the policies which mobilized that base, and put him in the Oval Office.